RAM Grinding is here to serve you. Our 12,000sq ft facility offers CNC Lathe, CNC Mill, CNC O.D. Grinding, Manual Mill, Surface and Centerless Grinding capabilities. We do work for Medical, Automotive and Aerospace facilities, just to mention a few. RAM Grinding is a family owned business since 1993. We specialize in High Precision grinding of machined parts. We do the finish grind work on machined parts from shops nationwide. We offer expedited service whenever the workload permits. We are not ISO Certified, but will provide Conformance Reports as requested. Jim Horton (Owner) 52 years experience, responsible for overall Operation, Set-up, Operating and Overseeing O.D. Grinding areas. Jim is easing into retirement and phasing out I.D. Grinding. We will no longer be offering this service. Donovan Horton (Co-Owner) 20 years experience, responsible for Set-up, Operating and Overseeing Centerless and O.D. Grinding areas. Kelly Horton (Co-Owner) 25 years experience, responsible for Set-up, Operating and Overseeing Machining Operations and Surface Grind areas. More than likely you will deal with one of our Office staff to initiate quotes, set up accounts, questions about accounts Payable and Receivable and check status of orders. 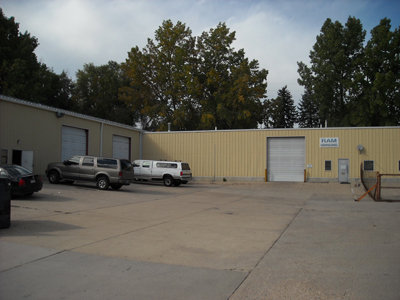 Our machine shop has 3 Coolorado Coolers which keeps us comfortable in the summer heat. Click here to see the article about our facility.